Every so often a song comes along which does exactly what it says on the tin. An Indian Summer is a period of warm weather appearing unexpectedly in the autumn, long after all concerned assumed that only crappy weather was on its way. Not everyone appreciates these indian summers, of course, but most people love the pleasant surprise of something you assumed lost reappearing. And now Manic Street Preachers have come up with a song called ‘Indian Summer’ and y’know what? It’s fantastic. ‘Indian Summer’ is off their new album, Send Away The Tigers. It’s ace. The whole thing is an completely unexpected return to form. The band sound like they care again. You can tell because, unlike the previous two albums, it sounds nothing like Nicky Wire has described it. KYE was a mess which scared away fans. Lifeblood was overly smooth and eleagic. SATT is not their debut Generation Terrorists updated. It’s way better than that. It’s like EMG, the album this writer regards as the best of all time. Obviously, it’s not that good but it’s loud, fast, melodic, etc etc. It is the unexpected dose of the stuff you feared was gone. In short, an indian summer, and best of all, the song which bears that name is the best thing on the album (from what I’ve heard). I don’t know what it seems to be about 2007. A handful of my favourite bands from the nineties have been reinvigorated to attempt that elusive ‘return to form’ tagline that every band struggles with, after reaching any critical/commercial peak in their career. I’ve already posted new tracks from Idlewild and Ash that suggest a sort of nostalgia for a sound that the band has evolved away from but yearns to resurrect. The Manics are the next on the boat, with new single Your Love Alone Is Not Enough returning that bombast and confidence together with a pared down sound. Is it that as bands get older, their rough edges that might have endeared you to them in the first place have been worn down with sandpaper and (more likely) cleaner-cut production? A lot of people seem to suggest that, claiming Idlewild’s A Remote Part and Warnings/Promises didn’t ‘rock’ as much so they weren’t on par with earlier releases. Is it just the tunes? the times? or that we can’t have the same emotional contact with a band’s 4th/5th album as opposed to their debut? In general I believe the latter to be the case. I could take someone like the Super Furry Animals, where every album is equally worthy of merit, yet if it came to a favourite album of theirs, I would have to side with Radiator, simply because that’s the one that first hit home. Again, Supergrass -> In It For The Money, same reason. There’s been plenty of debate about the Modest Mouse album, how it’s trying to be a commercial retread of what they did on Lonesome Crowded West or The Moon and Antarctica. I’ve only heard a handful of songs from those two albums, and a couple off the new record, and I’d have to say that I prefer the new ones I’ve heard. Is that because my entry point was Good News For People Who Love Bad News? Is anyone else following me here? Then again, there’s an argument that comes up to destroy any sort of discussion, saying that ‘it is as much about the person as it is about the music, so of course opinions are going to differ, noone’s right or wrong’. But that’s a cop out… and where’s the fun in that? 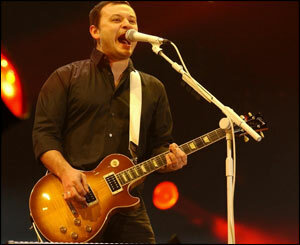 I am well aware that there are few bands out there who summon the spirit of Marmite quite like the Manic Street Preachers, so it was quite intriguing to watch the solo albums by the two remaining guitarists, lead guitarist/singer James Dean Bradfield and bassist/lyricist Nicky Wire, attract neither delirious praise nor acidic bile. In fact other contributors to this blog weren’t even aware that both had put out solo albums this year. Such is the journey to the quiet margins for one of the biggest, and most in your face, bands of the 1990s. And it is just typical of this brilliantly perverse band that after one terrible album (Know Your Enemy) and one understated album (Lifeblood) it took them going solo to remember who they really are. It really is a blast of revitalised Manic Street Preachers, but that’s to say these are two Manics albums, rather two albums which demonstrate how the Manics came about from two different personalities. In brief, James’s albums is big and glossy. This is where ‘Design For Life’, ‘If You Tolerate This…’ and ‘Sleepflower’ come from. It has big production, hand claps and sha-la-las. It also has a sense of melancholy and nostalgia about it. Lyrically simplistic but there are no furious attempts to cram the entirely of Das Capital into a three minute rock song so it flows. JDB has never been a man afraid of a soaring melody and The Great Western soars a lot, lush keyboards, his distinctive and brilliantly diverse guitar work. And the voice. If we forget that JDB has one of the bets voices of the 1990s then we are fools. 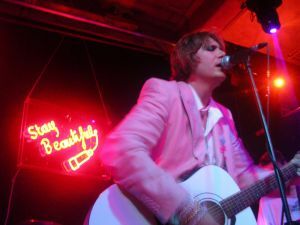 Nicky Wire on the other hand is famous for not having a good singing voice, more a ranting tool. He also plays bass, albeit not amazingly. So therefore logically his album features no bass and a newly acquired, punk rock, fractionally off key but almost always listenable singing voice (in my opinion, you’ll have to try it for yourself). But if JDB was always expected to come up with a solid album then Wire’s has been the greater triumph as even avid Manics fans did not expect him to come up with something as good as I Killed The Zeitgeist. It’s indie as indie used to be, lo-fi, low key and unexpectedly thrilling. Yes, he does still try to cram in big words and ideas into every song, but the excesses of recent times are gone and the angry poetry is back. Even better his handle on an unexpected softer side comes up with some of the best songs of the year. Ultimately the only down side of both albums is the feeling you when listening to the best tracks (‘English Gentleman’ (JDB), ‘The Shining Path’ (Nicky), ‘Break My Heart Slowly’ (Nicky), ‘Run Romeo Run’ (JDB)) you find yourself wondering how amazing they would be as full band Manics tracks. But just like Star Wars Episode 3 made me want to watch 4-6 again, this is no bad thing. This is why these albums are here together. They belong together, like their creators. Number one in UK when I was born: Wham! – 'Freedom'. First album bought: Catatonia International Velvet. Still one of the best ever. First gig attended: Space at the Stoke Sugarmill (I think) in 1998. I was 13 and went with my mum. Favourite album: Manic Street Preachers Everything Must Go but after that Elastica - Elastica. Favourite song: Manic Street Preachers - 'Design For Life' but after that Interpol - The Specialist. Favourite gig: Manic Street Preachers at V2002 or possibly Arcade Fire at Leeds 2005. This is pretty much a tie. Favourite genre: Indie, but I'm fairly unfussy. The band you like but are embarassed about/feel is a little out of place in your collection: Girls Aloud own pop. Number of CDs bought since 1st January 2006: 45 with others acquired (legally) for free. What musical event would you most like to see happen: The ghosts of John Lennon, Kirsty Maccoll and Richey Edwards (he's dead) chasing Simon Cowell, Louis Irish fella and all other pop svengalis who think dull dull ballads are enough to justify pop groups' existences, off the white cliffs of Dover. Musical hero: John Peel. He liked what he liked, regardless of genre or whether anyone else liked it. Music's biggest enemy/ies in my opinion are: The aforementioned pop managers who believe that image is enough to sell records (an aural experience) and have corrupted pop as a result. Good pop is about good songs as well as the image. We are slowly remembering this but tripe like Westlife still exists so beware. Tracks are for sampling purposes only and will be deleted two weeks after this entry.